In his final career win as a starter, Bob Gibson achieved a milestone. On June 27, 1975, Gibson earned his 250th career win, pitching six innings in a 6-4 Cardinals victory over the Expos in Game 1 of a doubleheader at Montreal. 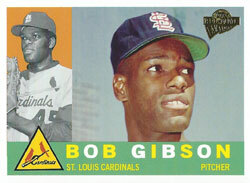 _ Gibson became the first and only Cardinals pitcher to achieve 250 wins. No one else has come close. The pitchers with the next-best career wins totals as Cardinals are Jesse Haines (210) and Bob Forsch (163). _ Gibson was the career wins leader among all active big-league pitchers in 1975. _ The win was the first for Gibson since May 5, 1975. Gibson, 39, shut out the Expos through six innings. Gibson also contributed a RBI-single in the fifth off Expos starter Steve Rogers and scored on a Ted Sizemore two-run double. In the seventh, with the Cardinals ahead, 4-0, the first two Expos batters reached base and Gibson was lifted by manager Red Schoendienst. Ron Bryant relieved and yielded a RBI-double to Barry Foote. Rookie Greg Terlecky replaced Bryant and gave up a two-run single to Bob Bailey. Two of the runs were charged to Gibson. Gibson’s line for the game: 6 innings, 5 hits, 2 runs, 6 walks, 1 strikeout. Gibson made two more starts, the last of his career, against the Phillies and Giants, and lost both, dropping his season record to 2-8. His 251st and final win of his career came in relief on July 27, 1975, against the Phillies at St. Louis. Relieving rookie starter John Denny in the fourth, Gibson pitched four shutout innings in a 9-6 Cardinals triumph. Gibson struck out Larry Bowa and Mike Schmidt to end the sixth and struck out Greg Luzinski to start the seventh. It was Gibson’s first win in relief since beating the Mets on the final day of the 1964 season, clinching the National League pennant for St. Louis. Gibson made six more relief stints for the 1975 Cardinals and lost two, finishing his final season at 3-10 with a 5.04 ERA. In 17 seasons (1959-75) with St. Louis, Gibson was 251-174 with a 2.91 ERA. Among his accomplishments: two NL Cy Young awards, two World Series Most Valuable Player awards, a NL MVP Award and nine Gold Glove awards. He was elected to the National Baseball Hall of Fame in 1981. Sad watching your hero inexorably lose ground to Father Time. Thank you for your comment. Agree.